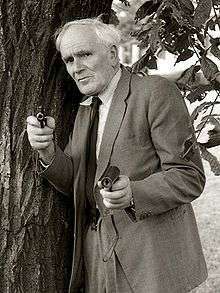 Desmond Wilkinson Llewelyn (12 September 1914 – 19 December 1999) was a Welsh actor, best known for his role as Q in 17 of the James Bond films between 1963 and 1999. Llewelyn was born in Newport, Monmouthshire, the son of Mia (née Wilkinson) and Ivor Llewelyn, who was a coal mining engineer. He originally wanted to be a minister, but during his education at Radley College, he worked as a stagehand in the school's productions and occasionally picked up small roles. The outbreak of the Second World War in September 1939 halted his acting career; Llewelyn was commissioned as a second lieutenant in the British Army, serving with the Royal Welch Fusiliers. In 1940, he was captured by the German Army in France and was held as a prisoner of war for five years. Llewelyn was chosen for the role of Q because of his work with director Terence Young in the 1950 war film They Were Not Divided, in which he played a tank gunner. Beginning with From Russia with Love in 1963, Llewelyn appeared as Q, the quartermaster of the MI6 gadget lab (also known as Q branch), in every EON Bond film until his death, with the exception of Live and Let Die in 1973, in which the character Q did not appear. Llewelyn was the only actor in the original Bond series to have worked alongside five of the actors who played the spy. His last appearance as Q prior to his death was in The World Is Not Enough in 1999. During his briefing of 007 in the film, Q introduces John Cleese's character, R, as his heir presumptive, and the film alludes to Q's retirement to which Bond, after seeing Q, expresses his hope that it will not be any time soon. Q's response is to admonish Bond to "always have an escape plan", after which he lowers himself through the floor of his lab. Llewelyn had stated not long before his death that he had no plans to retire and that he would continue playing Q "as long as the producers want me and the Almighty doesn't." In the 2002 film Die Another Day, John Cleese's character is the head of Q branch, having inherited the title of quartermaster from his predecessor. In all, Llewelyn appeared in 17 Bond films, more than any other actor, and worked with the first five James Bond actors. He also portrayed Q in a 1967 EON produced television documentary entitled Welcome to Japan, Mr. Bond, which was included in the 2006 special edition DVD release of You Only Live Twice. Although one of British cinema's most recognisable characters and an important and long-standing element in the 'Bond' franchise, 'Q' did not make Llewelyn rich—the actor was merely paid 'by the day' for his few hours of work on-set and did not share in the money made by the films. Nevertheless, because Llewelyn was considered one of the franchise's major institutions and also immensely popular among Bond fans, Llewelyn starred in several commercials, including ones to promote the video games GoldenEye 007 and Tomorrow Never Dies. Llewelyn made a brief appearance in "Little Mother", an episode of The Adventures of Robin Hood. He also appeared in other films such as the Ealing comedy The Lavender Hill Mob (1951), the 1963 film Cleopatra (as a Roman senator), and the 1981 PBS production of Dr. Jekyll and Mr. Hyde, and he had a small role in the musical Chitty Chitty Bang Bang (1968), which was itself based on a children's book by Bond author Ian Fleming. In 1961 he made an uncredited cameo appearance early on as one of the Marques's servants in the Hammer Film Productions of The Curse of the Werewolf. He also acted on stage with Laurence Olivier and Vivien Leigh (appearing as an extra in Olivier's 1948 film Hamlet) and appeared as Geoffrey Maddocks ('The Colonel') in the British television series Follyfoot from 1971 to 1973. The Bond film Live and Let Die was filmed during the third series of Follyfoot and Llewelyn was written out of the series for three episodes to appear in the film. However, the Bond producers ultimately decided to leave the character out of the film anyway, much to Llewelyn's annoyance. He was the subject of This Is Your Life in 1995 when he was surprised by Michael Aspel. Despite playing an inventor in the Bond films, Llewelyn always maintained that he was totally lost in the world of technology, a trait that also plagued his successors, John Cleese and Ben Whishaw. 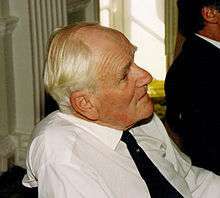 A biography entitled Q: The Biography of Desmond Llewelyn was written by Sandy Hernu, and subsequently released on 1 November 1999. On 19 December 1999, while driving home alone from a book signing event, Llewelyn was involved in a fatal car crash. His Renault Megane had a head-on collision with a Fiat Bravo driven by a 35-year-old man on the A27 near the village of Berwick, East Sussex. Despite attention from a doctor called to the scene and transfer by helicopter to Eastbourne District General Hospital, he died shortly thereafter at the age of 85. The other driver was seriously injured. An inquest recorded a verdict of accidental death. Llewelyn's death occurred three weeks after the premiere of The World Is Not Enough. Roger Moore, who starred with Llewelyn in six of his seven Bond films, spoke at his funeral on 6 January 2000. He was buried at St Mary the Virgin churchyard in Battle, Sussex. His widow, Pamela Mary Llewelyn, died in East Sussex in 2001, aged 85. His son, Justin Llewelyn, died in 2012, aged 60. ↑ "Desmond Llewelyn Biography". Retrieved 19 November 2010. ↑ From an interview on the DVD release of The World Is Not Enough. ↑ "Llewelyn's last interview (with reference to ''Follyfoot'' and ''Live and Let Die'')". Follyfoot-tv.co.uk. 19 December 1999. Archived from the original on 17 February 2012. Retrieved 19 November 2010. ↑ "Bond actor killed in crash". BBC News. 19 December 1999. Retrieved 25 August 2013. ↑ "Road death of Q actor accidental". The Guardian. London. 14 June 2000. Retrieved 12 September 2012. ↑ "James Bond's tribute to 'Q'". BBC News. ↑ "Desmond Llewelyn (1914–1999) – Find A Grave Memorial". ↑ "In Memoriam; Justin Llewelyn, 1952–2012". ↑ Bray Lower, Cheryl; Palmer, R. Barton, eds. (2001). Joseph L. Mankiewicz: Critical Essays with an Annotated Bibliography and a Filmography. McFarland. p. 257. ISBN 9780786409877.